By 2013, the Diocese of Niagara is recognized by Anglicans and the wider community as a leader in advocacy and justice for the benefit of all beings; a faith community that practices what it preaches transforming lives by the grace of God. At St. George’s this element of the vision has highlighted some of the work and ministry that we have already be working toward. In 2012, St George’s Pastoral Care Team with the Hamilton and Halton Alzheimer Society hosted a “Circle of Friends” event in May and in June a three day Dementia Education workshop. These events were directed toward family members and friends of individuals with dementia who are living in Halton Hills. Links2Care Youth Programs are committed to providing a safe and positive environment for youth. Links2Care Youth Centres, Open Door in Georgetown and Off The Wall in Acton, strive to provide youth supervision, information, supportive services, referral services and education to youth in Halton Hills. Youth Workers support a safe-non-judgmental, confidential and inclusive environment to promote youth to develop skills in leadership, cooperation, problem-solving, positive relationships, responsibility and confidence. Since 2011, our Rector has been active in participating community meetings about Youth Issues held in town and has liasoned at these meetings with the local Public Health Nurse, administration from both High School, the local police, Open Door staff, students, and parents. Open Door and interaction with Youth at the High School are a part of everyday at St. George’s. The Halton Fresh Food Box programs is designed to encourage people in our community to eat healthy and when ever possible to eat locally grown produce. St. George’s has over a dozen regular volunteers who help pack at the Georgetown Christian Fellowship Church along with other church and community volunteers. St. George’s is also a pick up site for Georgetown and two volunteers coordinate and help hand out the boxes and take new orders. St. George’s is fortunate to have Henriette Thompson, who is Coordinator of Ecumenical, Interfaith, and Government Relations for the Primate’s Office, who is able to keep us up to date on important happening on the national level like the Truth and Reconciliation Gatherings. In the last few years, St. George’s has been finding ways to be more present in our community. To be seen being and living a full Christian life in our community. An important part of this has been by having more informal-feeling gatherings in public places, like at a Pub on the main street (Spirited Study). 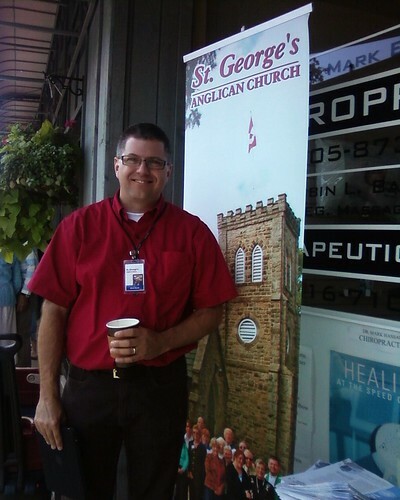 We have also staffed a booth at the summer Farmer’s Market to promote St. George’s and our activities. St. George’s has participated in this ecumenical event for the past four years. 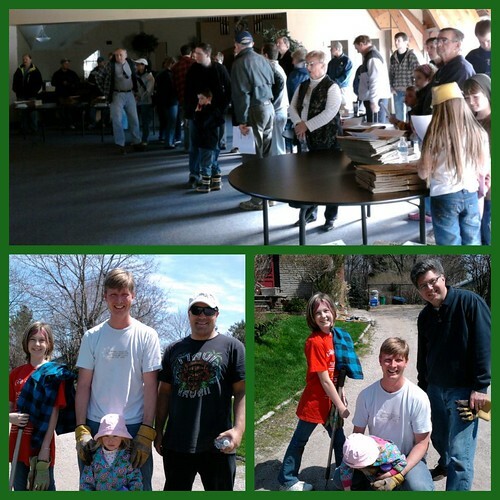 It has included helping to host a picnic open to the public celebrating our Christian faith, but also has involved a community clean up project which has the local churches team up with CASHH and Links2Care to provide volunteers to do free yard clean up for people suffering from cancer or other illnesses or who just needed the help due to age or infirmity. St. George’s has helped to promote this work, sent teams to clean up yards and helped provide volunteer leaders to coordinate other related activities. Check out our Diocesan “Prophetic Social Justice Making” website here.